Convective cores simulated at various horizontal resolutions using the WRF model. Warm colors indicate rising air, while cool colors show descending air. Contours indicate liquid water. Current research efforts in mesoscale and boundary-layer dynamics utilize novel numerical and observational techniques. 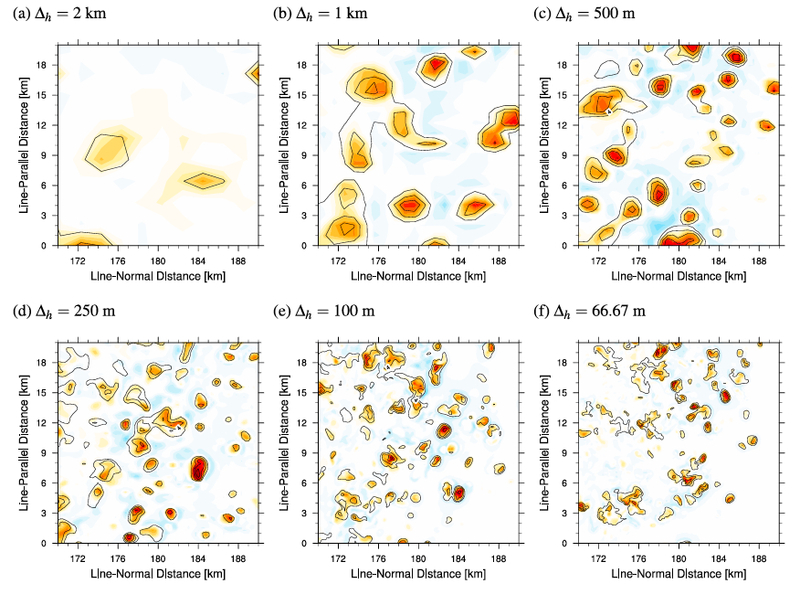 High-resolution model simulations are utilized to understand the connection between the micro-scale (cloud microphysics) and mesoscale motions, particularly in deep convective clouds (Lebo). Several other key problems in the fields of mesoscale and boundary-layer dynamics are being explored using state-of-the-art observations, including stratified flow over complex terrain, coherent boundary-layer circulations (especially in cold-air outbreaks over water), and the initiation of deep convection (Geerts). These observational efforts rely heavily on the Wyoming Cloud Radar onboard the University of Wyoming King Air.